The lazy man food that is a cold salad of some sort has traveled with me through life from the potluck culture of America (and especially my university, The Evergreen State College). I cannot count how many of these salads I made during those few years – you would think that I would never do it again, considering how often it was required of me in those years. I have one particular memory of having made both of the salads I made tonight (tomato green bean and mozzarella and the sesame noodle with prawns, as shown below). I was taking a “field trip” to Victoria, British Columbia with a couple of classmates and our Russian teacher (who was in the US for a year or half a year or something). Our class consisted of three other students and me – and one of those students, a Polish woman, could not attend. Thus, I did all this cooking, all the driving and off the four of us went. I got the worst, most brutal sunburn of my life on that excursion – on the ferry from Port Angeles, Washington to Victoria on a deceptively overcast day. I also realized the perilous depths of my propensity for seasickness. The one guy in my class, a nice guy apart from his hopeless, shameless and relentless flirtation (presumably one factor that may have led to the demise of his marriage), talked me through the seasickness very sweetly, talking, telling me stories, trying to distract me by singing Marlene Dietrich’s “Lili Marlene”. “Crush” is not something compatible with my aloof, indifferent personality and often laissez-faire attitude toward pretty much everything. But he is one of the few people who caused me to feel the real ache of crushing on someone who is completely out of reach. It was on the trip home from what was a beautiful day in Victoria that we stopped to have a picnic of sorts and ate these lazy salads. We contentedly sang together the rest of the way back to Olympia. We started off with songs we all knew (the Russian songs we were learning in class, for example) and moved on to the entire Cowboy Junkies’ catalog (although by the end of that I was the only one singing since no one else knew the songs). Interested in making your own salad – whether or not it ends up being inextricably linked to stirring and sharp memories, made while eating it – follow the recipe below. Mix all ingredients together (other than noodles, prawns and green onions). Cook the noodles according to instructions (or very slightly undercook them, as they will soak up more of the dressing). Cool the noodles, rinsing under cold water. Drain well. Mix the dressing into the noodle and refrigerate for a few hours. 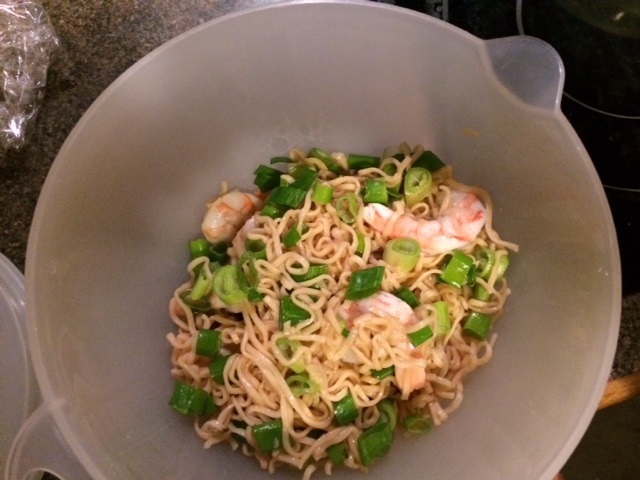 Cook the prawns, chop the green onion, toss into the noodle mix. Refrigerate overnight if desired as it helps flavors develop. Or eat immediately.